I was so honored when Reach out and Read, Georgia asked me to write a blog post for Learn4Life. It was published recently, and I'm so happy to share it with you. The Learn4Life 3rd grade reading proficiency network recognizes the importance of building literacy skills long before students reach school. L4L has identified Reach Out and Read Georgia as a bright spot in early childhood education, and is proud to support their work. Reach Out and Read Georgia is an evidence-based nonprofit that partners with health care providers to prescribe books and encourage families to read together. By providing age-appropriate books to children at well-child visits from six months to five years of age, Reach Out and Read Georgia prepares children for school and encourages a lifelong love of reading. Children served by Reach Out and Read Georgia enter kindergarten with larger vocabularies, stronger language skills, and a three- to a six-month developmental edge. My name is Iyabo Ojikutu (formerly Okuwobi). I’m a board-certified pediatrician and private practice owner. I’m the author of three books. My author journey started in 2015. One is published. The second is to be published soon, and I’m writing the third. I’ve had the privilege of speaking at the United Nations. I’m also a blogger, and I blog about all topics related to living a balanced, wholesome life. How did I achieve all these goals? By reading a lot of books! Reading many many big medical books to become a doctor. The reading started from when I was about two or three years old when my dad would read to me, and then I started sight reading and sounding out words by age three or so. And on I progressed to reading a lot of books through my primary and secondary education, then ultimately through medical school, and I am still an avid reader today. I continued to read a variety of genres even after becoming a doctor. The continuous reading was obviously preparing me for my own writing journey which finally came into full expression in 2015. I haven’t stopped writing since then…..books, blogging, pieces for my social media posts; and writing speeches for speaking engagements. Reading has been responsible for all my successes, and I’m only just getting started. Naturally, I want the same for every little kid. If I could have my way, I’d provide books, and the same opportunities I’ve had with reading from a very young age to every kid in the world. But, since I can’t change the world (at least, not yet-perhaps someday soon), I can change my community. I was first introduced to the Reach Out and Read program while in residency at Bronx Lebanon hospital in 1998. I was fascinated and impressed by the concept. Prescribing free books to poorly advantaged kids from six-months-old is a brilliant idea. I became actively involved with the program then, and became a prominent advocate, reminding my fellow residents to make sure they were consistent with prescribing the books to families and educating them on the importance of reading aloud to nurture family relationships and healthy brain development. Fast forward, I relocated to Atlanta after residency and opened my private practice in 2004. It happened to be located in an economically disadvantaged area in Atlanta. What immediately came to mind? Reach Out and Read Georgia! Yes, I could have this in my practice! I could start to promote early literacy and the importance of reading in a kid’s life from a very young age. 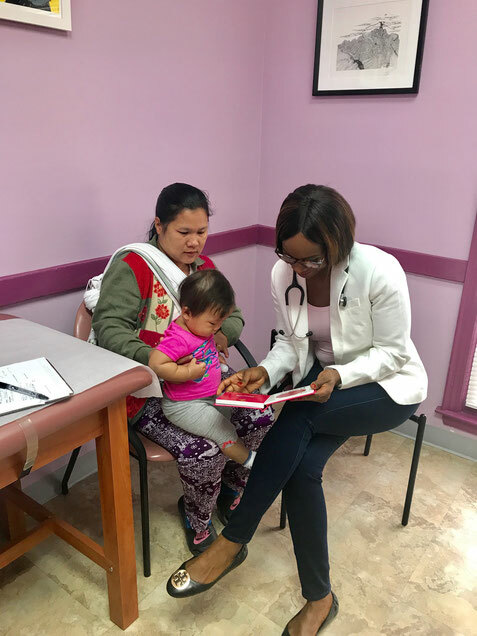 So, for the past 15 years, myself and my staff at my office, Milestone Pediatrics, have been providing books for all children between the ages of six-months to five-years at every well-visit checkup. Milestone Pediatrics has conducted 35,525 well-visit checkups and has distributed 24,419 children’s books since 2005. My staff all love this program, and our patients and their families absolutely love receiving these books. A book is a powerful tool, and the guidance (milestones, behavior modeling, encouragement, etc.) we provide to parents in the exam room is equally essential in the delivery. We have received so much feedback from families about how their kids love reading aloud; and how their speech has developed fast, how it has helped them learn English more quickly, and how it has increased their child’s overall vocabulary. Many of these kids still ask for books even after age five. They’ve loved receiving these books from us and enjoy reading so much; they don’t want to stop. In my practice, we serve a very diverse population ethnically and culturally. Many are refugees from different parts of the world. English is not the primary language for many of them. However, even the parents who do not read or speak English can read to their kids by telling the story in their own words just by observing the pictures. Even though I cannot accurately or tangibly measure the impact my practice and Reach Out and Read Georgia has had on all these kids and their families over the years; I know for sure that what reading has contributed in my life is what will be manifested in many of these kids’ lives as well. Thank you, Reach Out and Read Georgia; for giving me such an excellent opportunity to sow into the future of so many children. I am truly humbled and privileged to be a part of this life-changing program. Connect with Reach Out and Read Georgia on Facebook. Connect with Dr. Iyabo Ojikutu’s (Okuwobi) through her pediatric practice, and find her book ‘Permanent Happiness’ on Amazon. Her Blog (The Peace Place Blog) is on her website. There, you can find all her social media links, where you can follow her and stay connected with her work.